From the Fat of Our Souls offers a revealing new perspective on medicine, and the reasons for choosing or combining indigenous and cosmopolitan medical systems, in the Andean highlands. Closely observing the dialogue that surrounds medicine and medical care among Indians and Mestizos, Catholics and Protestants, peasants and professionals in the rural town of Kachitu, Libbet Crandon-Malamud finds that medical choice is based not on medical efficacy but on political concerns. Through the primary resource of medicine, people have access to secondary resources, the principal one being social mobility. 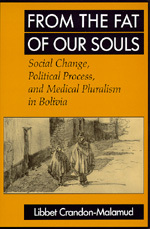 This investigation of medical pluralism is also a history of class formation and the fluidity of both medical theory and social identity in highland Bolivia, and it is told through the often heartrending, often hilarious stories of the people who live there. Libbet Crandon-Malamud is Associate Professor of Anthropology at Columbia University and Director of Gender Studies, University of Arkansas, Little Rock.